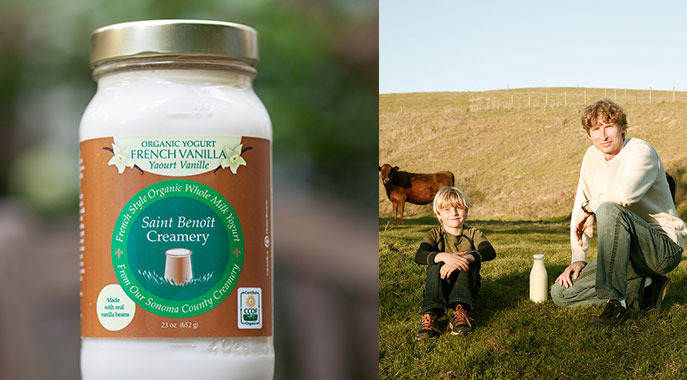 Saint Benoît Creamery: Support us with edible credits. We produce organic French style Jersey cows milk yogurt, organic low pasteurized Jersey milk and organic Yogurt cheese. We are located on a dairy in Two Rock Valley in Sonoma County and source all our milk from that single dairy. We package all our products in ceramic and glass preventing millions of plastics cups and bottles to end up in landfills. Our creamery is nearing its full capacity. Therefore, we are looking for investments so that we can we can expand our production facility and continue to grow sustainably by providing more yogurt in glass containers. Pre-paying Saint Benoit for the first time? Here's a low level to try it out. At the register, use the Credibles app on your smartphone to redeem your credits for Saint Benoit Creamery.